Put new cushions in your couch or favourite chair and you'll quickly get a whole new look. We have several cushions of Marimekko, OYOY and KAI Copenhagen for you. With cushions you can quickly give your interior a new look. For example, lay a number of colourful cushions over a solid sofa with a basic colour and the sofa looks completely different. In our shop you will find cushion covers from the Finnish design brand Marimekko. These always have a colourful appearance and are nice to notice. The round cushions of KAI Copenhagen are also tasty eyecatchers because of the large dot and cheerful colours. 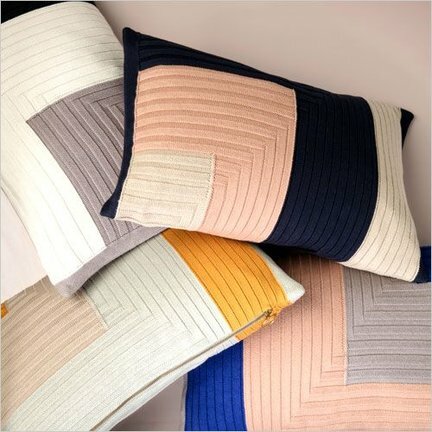 And Ferm Living literally blocks your gaze with their Colour Block cushions. Would you rather like a solid colour pillow for a quieter whole? Take a look at the Quilt cushions. Also made of Ferm Living, but with a full color and brass zipper. They are filled with down springs, so that's wonderfully soft. Dit kussen is gemaakt van een 100% katoen.